Drawing a diagonal in our referential coordinates X and Y we should ask ourselves if we are expanding the referential space or we are contracting it. Was it contracted or expanded previously? We modify the referential space, transforming it, folding or unfolding it, each time we displace our spatial coordinates without displacing in the same proportion the space to which they are anchored. We anchored our spatial coordinates to a specific space the first time we created our referential length and, with it, our referential area. 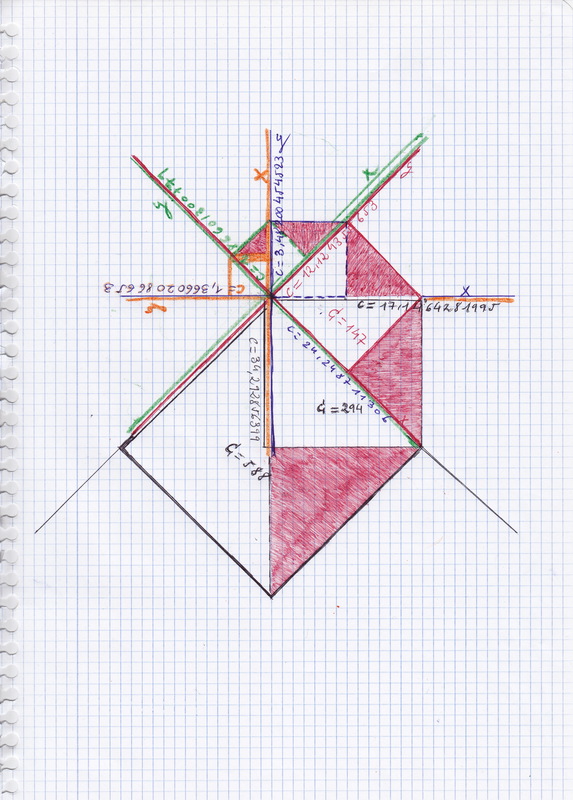 Drawing a diagonal from a created square, we are losing the proportionality with our referential length and our referential area. This break with the referential proportions has been considered traditionally as something “irrational”. It occurs something similar with the “prime” numbers, each time we create a prime number we create a new referential length or quantity. 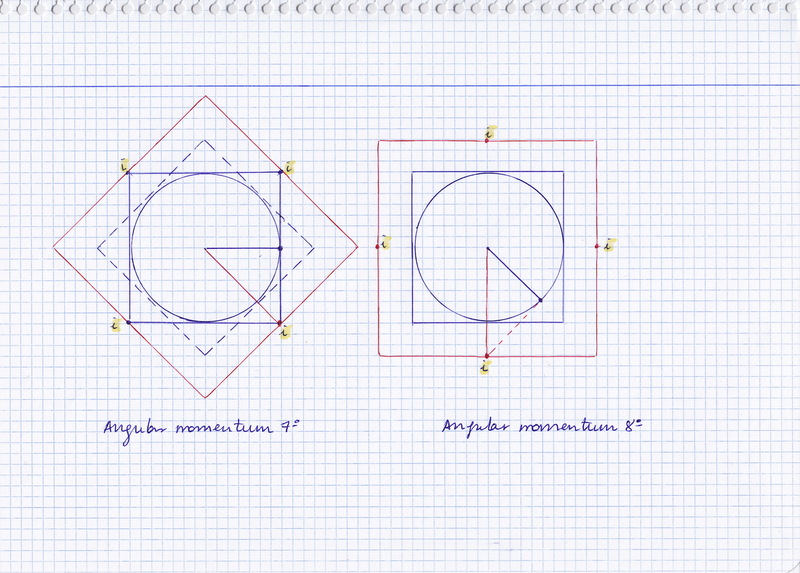 For example 8 or 6 or 4 are proportional with the referential straight length 2. We can measure 2 + 2 + 2 + 2. But if we measure 2 + 1, we break the proportion with the referential length “2” and we need to create a new referential length proportional with the first prime proportion represented by the length 1. 3 is proportional with 1, it is 1 + 1 + 1, there is a 1 in the middle and a 1 in each side. It keeps the symmetry with respect to our first reference. 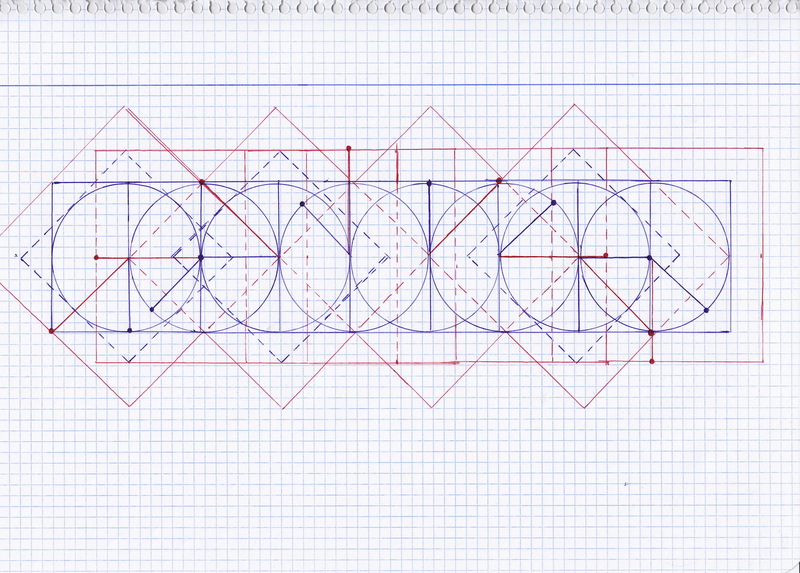 Now we can measure with our new prime number the length of 3 or 9 or 27, etc. 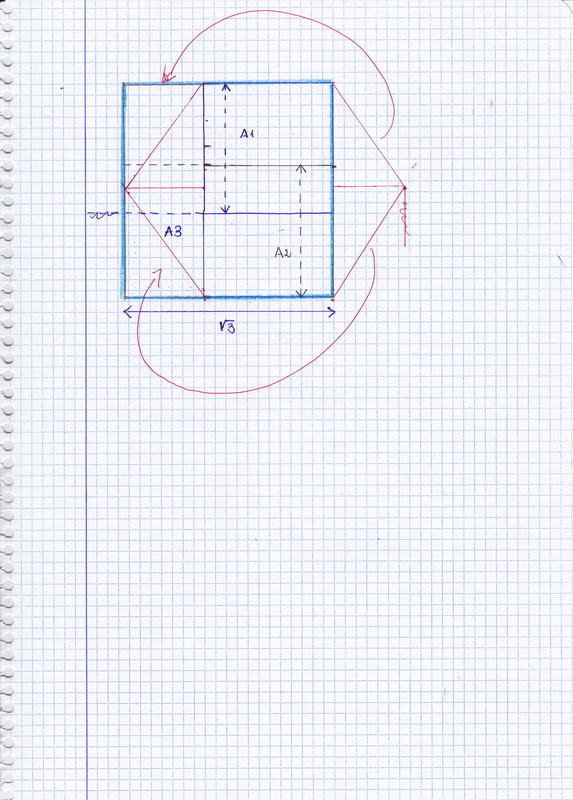 Taking two spatial coordinates and drawing a square area referred to them, each time we introduce a variation on the referential lengths and areas changing the existing coordinates without displacing at the same time their referential space, we are creating new referential lengths and areas which should be considered as prime or primary too, anchored to a different referential spaces. By example, when we create an hexagon we are creating a multidimensional figure. 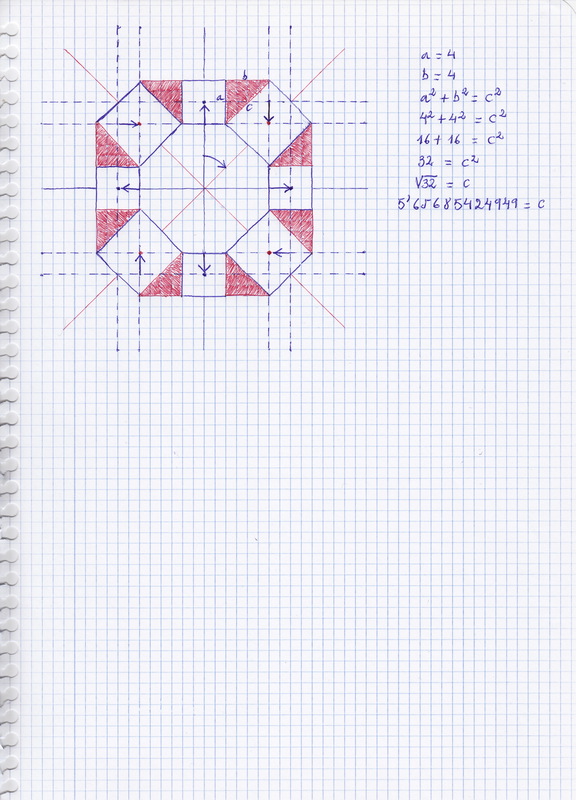 It is because the two square areas placed inside the hexagon overlap. 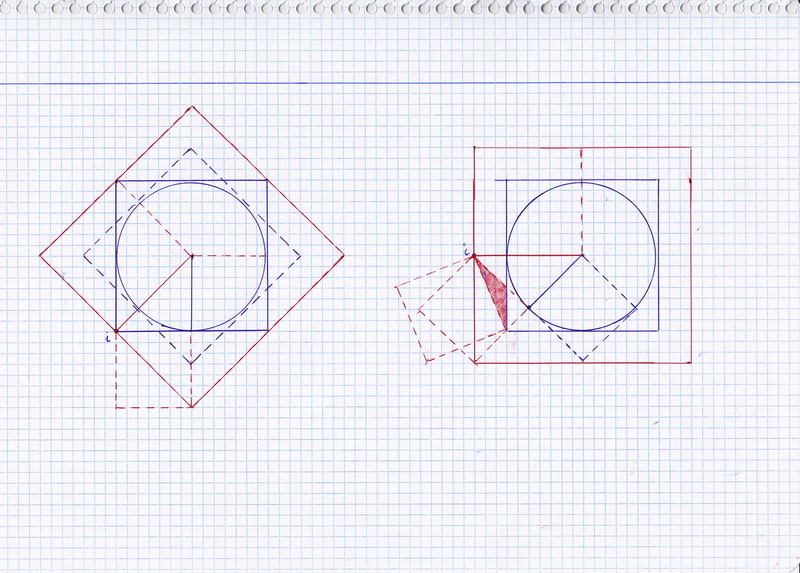 We have folded or contracted the space inside of the figure when introducing the diagonals creating equal sides. The figure represents a circle completing a turn on itself or moving on a straight line. The practical effect is as if the radius expanded and contracted, increased and decreased, periodically. But in fact the circular area has not changed at all. 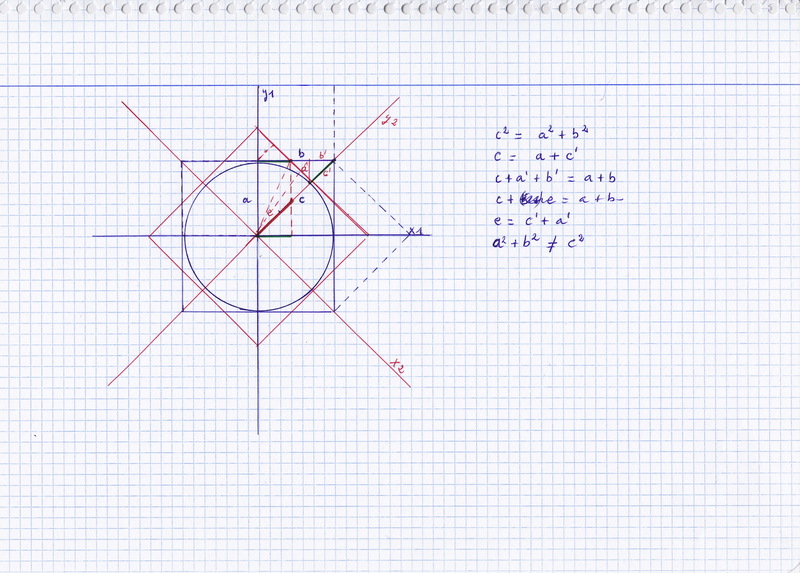 We can measure the radius following the referential length of our “rational” plane, the X and Y coordinates of a square. 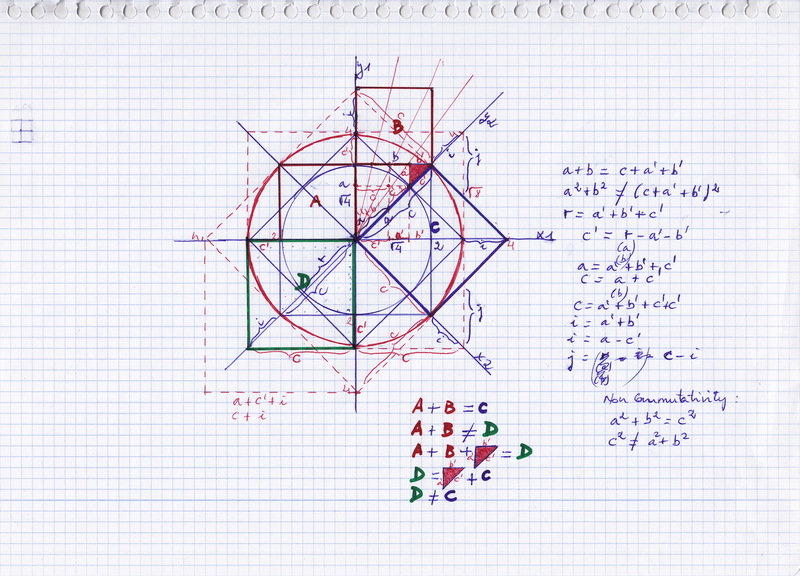 When it moves toward the “irrational” plane – the diagonal of the square – we can continue measuring it with the referential length of the rational plane. 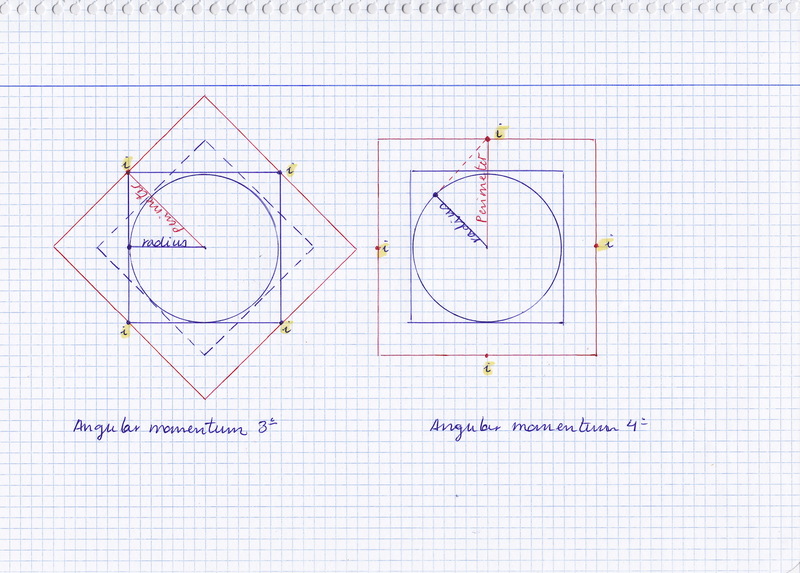 But we cannot make the same if we are considering the radius from the perspective of the perimeter of the circumference, because we need necessary to count outside of the “rational” referential square when the radius is on the diagonal. 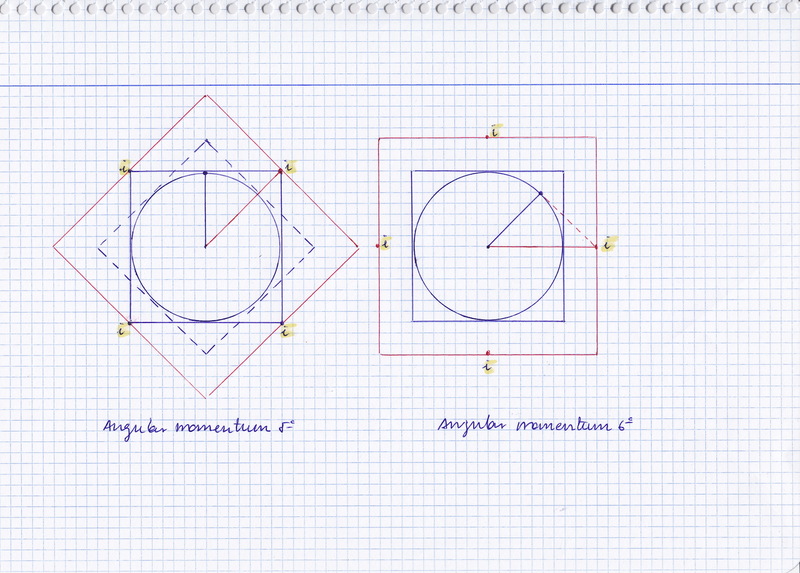 If we are not aware of that it is because we did not rotate the square at the same time than the circumference. 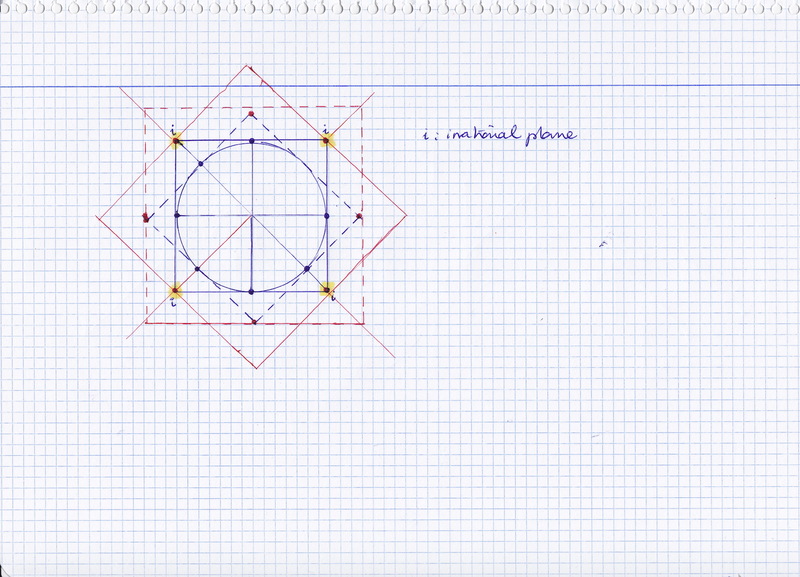 If we rotated our referential square too, we would see that when the radius is on the square’s diagonal, it is outside of our referential plane. It occurs that when the “irrational” radius arrives to the rational plane (to the X or Y coordinates) it is outside of the circumference and does not have relevance for our measures. So the irrational plane affects our “rational” measures only periodically. 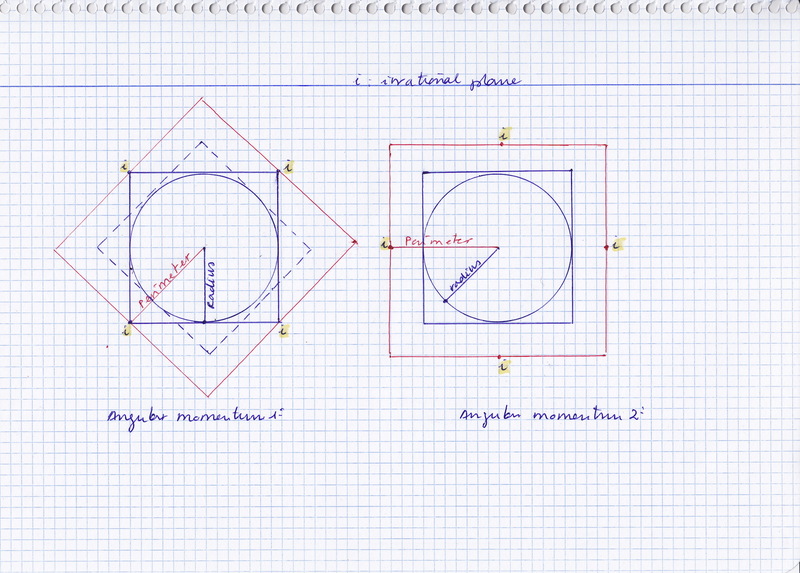 The differences between the radius following the rational plane (or coordinates) and the radius following the “irrational” plane, gives rise to Pi. There is a periodical alternation between both planes. It that can be considered as quantic. Depending on the time and the placed where is our referential radius (the angular momentum), we will be measuring with different referential lengths. 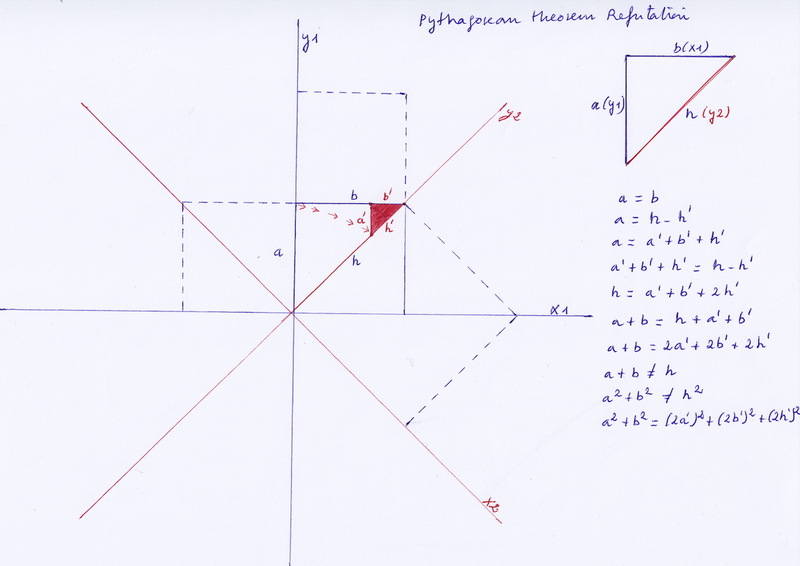 The Pythagorean Theorem represents the base of all mathematical trigonometry and most of scientific measurements. The main idea defended on this blog is that gravitational fields vary periodically, expanding and contracting; it is the cause of their inner motion, the pushing force that moves planets and crates atomic masses too. I consider it is possible to create fields whose areas effectively change periodically, expanding and contracting, while moving around of a central field. For that, it is necessary to combine the two different planes of the space – the rational and the irrational ones, each one with two different coordinates and referential lengths – moving effectively both planes for creating a multidimensional space; all coordinates have to complete a full rotation.